It can be tough to find the best solar power installer for your renewable energy investment. Your budget, energy needs, and customer-service expectations all play a role in your decision. You’ll need to research which company fits you and your project, which can take some time. Whether you’re looking to install solar on your home or business, there are dozens of companies that can help you. So, how do you choose the right one for your project? At West Coast Solar, we understand that it takes time to find the solar company that’s just right for your project. 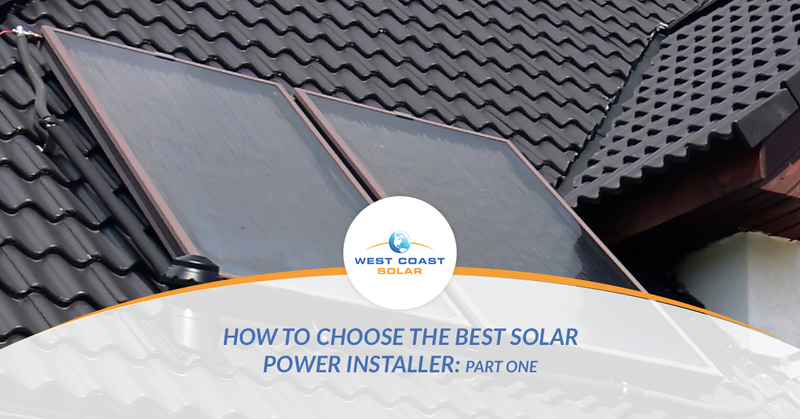 In this blog series, we share some in-depth information about how to choose a solar power installer. We’ll give you some questions to ask, what to look for when researching solar companies, and why it’s important to choose the right installer for you. If you want to work with West Coast Solar, give us a call today! We’ll discuss your energy needs, expectations, and budget to start the design on your system. Not sure where to start or what to ask? Give this blog series a read, and then let us know if you have any more questions. Asking the right questions is key to finding the perfect solar power installer for your home or business system. We’ve collected some common questions our customers asked us and some extras we think are important. One of the biggest reasons residents and business owners make the switch to solar power is the savings on their utility bills. This is a huge motivator for buyers due to the ever-rising energy costs across California, especially in Sacramento and San jose. The volatile energy market is causing distress and instability for many of those who live and do business in these areas. Solar power is one way to cut back costs by becoming energy independent. How much money will I save with solar power over the lifetime of the system? How much is the up-front cost? Will the solar power system increase the value of my property? You want to make sure the solar power installer you choose to hire has the proper licensing for your municipality/state and that they have insurance to cover their work, workers, and your property. Do you have the proper licenses and insurance to install solar systems in my municipality/state? Can I get your license number to validate your credentials? Do you design and install the solar system yourself, or do you subcontract it out? Will there be a master electrician on-site when my system is installed? It’s never been easier to find a solar power installer in San Jose, Sacramento, or the surrounding areas than ever before. The internet has offered businesses and consumers a unique opportunity to make the switch to solar. At West Coast Solar, we’re committed to serving you and your renewable energy needs. In part two, you will discover 20 more questions you can ask solar companies. Ready to talk about your project with a solar power installer? Give West Coast Solar a call today!